After a two-hour scenic drive through light rains and fog-blanketed mountains, we arrive at Omosako Koi Farm with just enough light to look through Koi. Takashi (Sacho), Takayoshi (eldest son) and Takahiro (second son) was waiting for us when we pulled up. When I got down from the car, Sacho greeted me with a big hug and a warm smile. Since having known a lot of the Japanese breeders from the time I was a child, I am blessed to be considered like family to most of them. 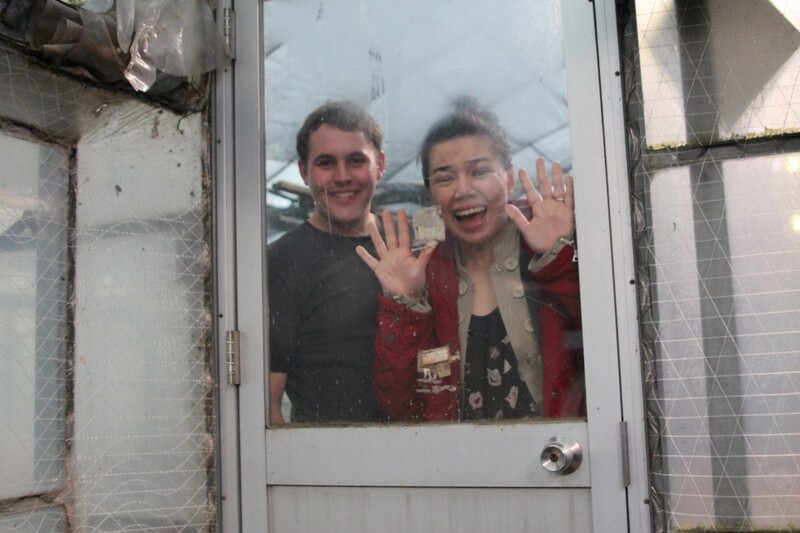 Normally guests are showed into a greeting room of sorts upon arriving at a farm for a drink and for catching up before looking at Koi, but since we were pressed for daylight, we were quickly ushered into the greenhouse to begin our selection. 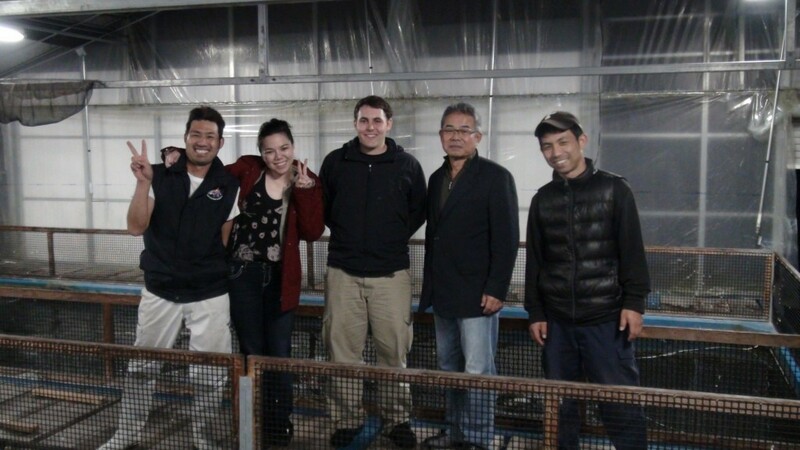 They had already seined a pond and pre-selected some Shiro Utsuri for us to look at so it only took a few minutes to go through that tank before Devin settled his Shiro Utsuri Jumbo Tosai Koi selection. 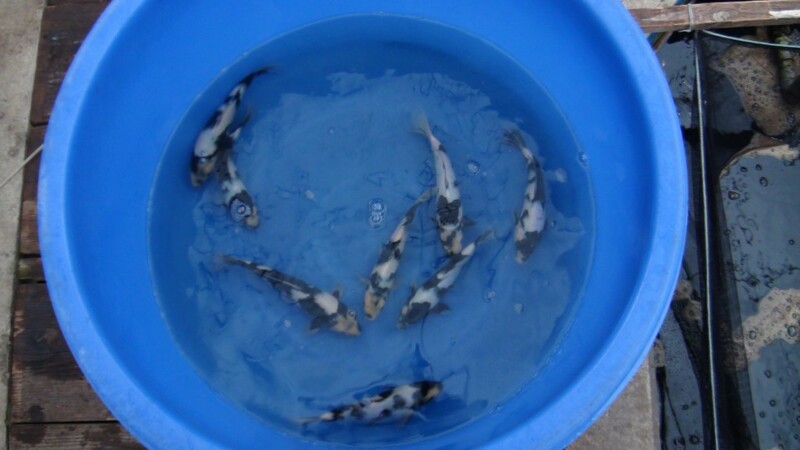 While Omosako Koi Farm is quite famous for their Shiro Utsuri, they do produce many other varieties. 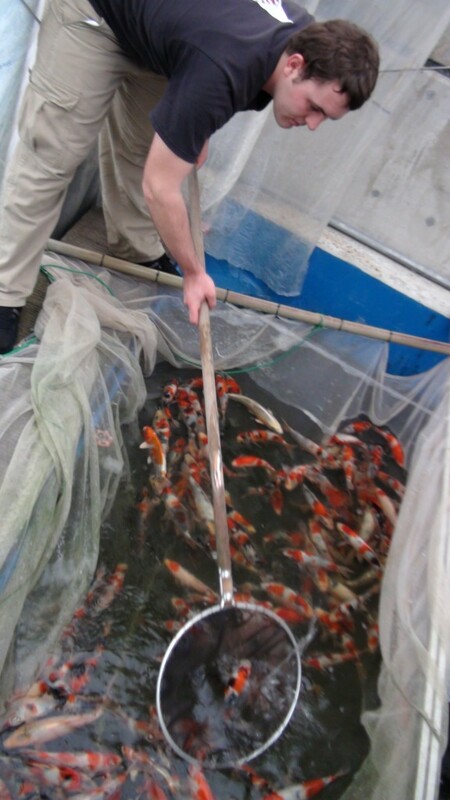 Several years back Takayoshi had interned for a few years at Dainichi Koi Farm to study showa breeding, and has since applied the skills he learned into breeding Showa at Omosako Koi Farm. This has been greeted with great success, which Devin has been taking advantage of for the past few years now. We are shown into an adjoining greenhouse where Takahiro seines the Jumbo Tosai Showa with the skill and agility of a ninja. 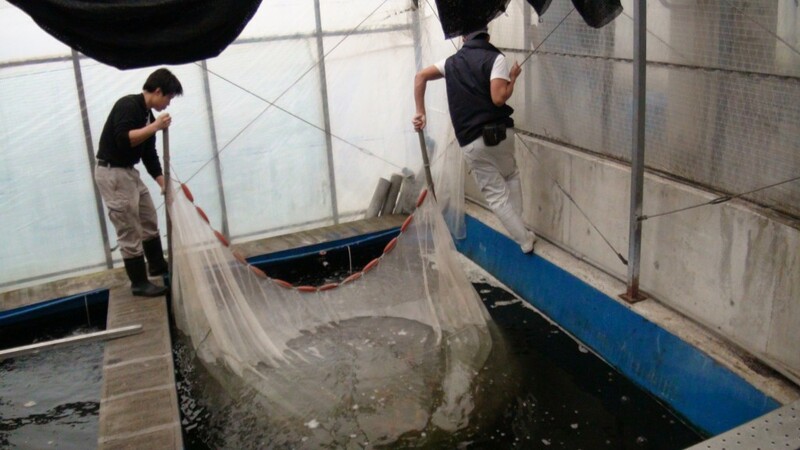 If there is one common denominator among nearly all the Koi Farms in Japan it is that there is nearly no room between the tanks to walk around. One almost needs to have been trained in the art of tight-rope walking to be able to go from tank to tank with ease. I first visited Japan when I was 13 years old, and since then it has always been this constant fear of mine: that I would find myself shifting my balance ever so slightly in the wrong direction, eventually sending me into the air only to cushion my landing with a whole lotta water and potentially very expensive Koi. It doesn’t help that more often than not my vision is through the lens of a camera, so depth perception and spatial navigation can be somewhat of a challenge. Thankfully I have not yet had to deal with that sort of humiliation in Japan, otherwise I believe my father (or Devin!) would probably be seeing a rather impressive bill from my therapist of choice. 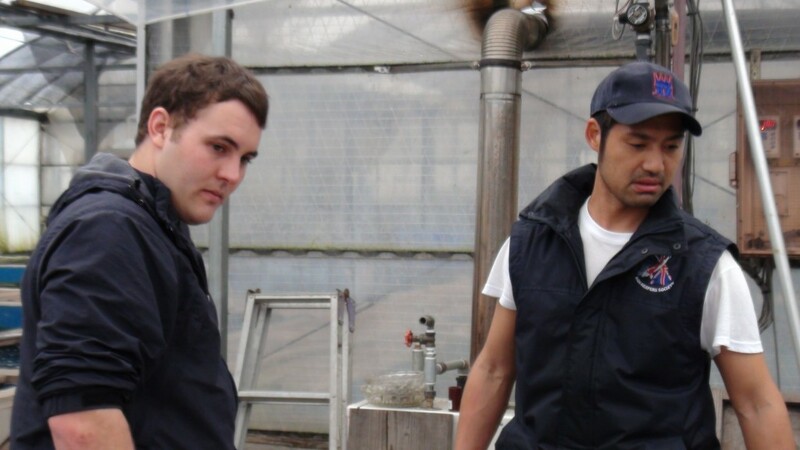 The pond was seined and Devin began making his selection, which Takahiro would then take into the larger greenhouse for photographing. 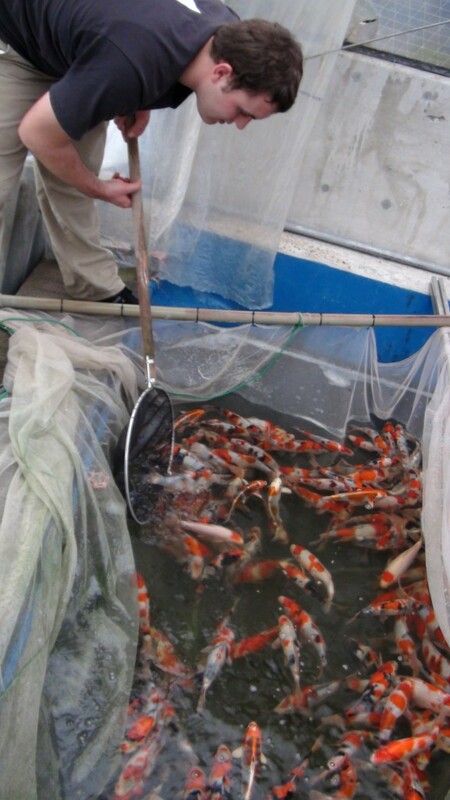 It takes a lot of skill to select Koi in Japan, not only for difficulty, but because speed is of the utmost importance. I find that most of the time, whether I’m with my dad selecting Koi or I’m driving around with Devin, we always seem to be pressed for time. If you’re not quick enough, several scenarios may leave you at best scratching your head with regret or at worst banging your head against the wall in frustration. We were quickly loosing light and Devin had to pick out the best fish from the bunch in under an hour. 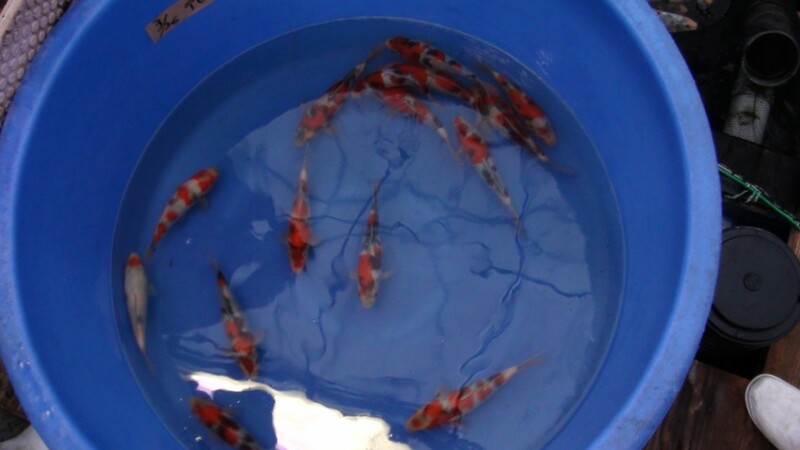 The quality of the Koi was very good, with each one being only slightly better or worse than the other. 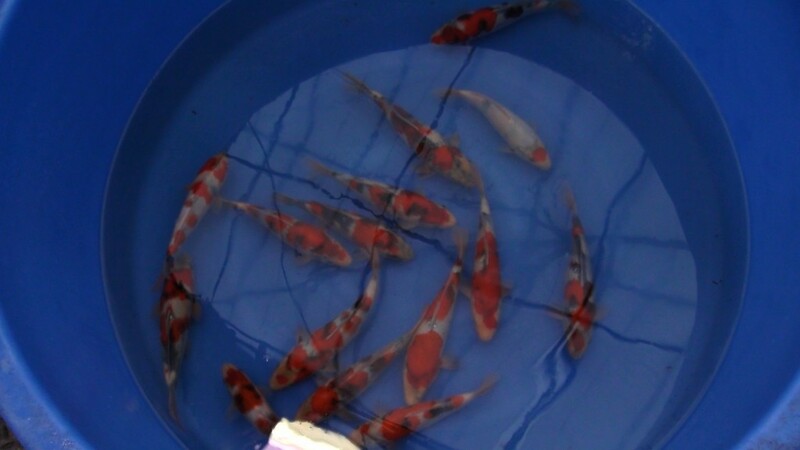 On top of selecting the best Koi, Devin also had to remain mindful of the different preferences that appeal to his customers so that he brings not only the best of the bunch, but also those that he feels would bring as much happiness to their future owners. After he was satisfied with his collection, which we then proceeded to document and photograph. This photo was from my blog post when we visited then and the first thing I noticed upon entering the greenhouse where we were to select Shiro Utsuri from was that the sign was gone! 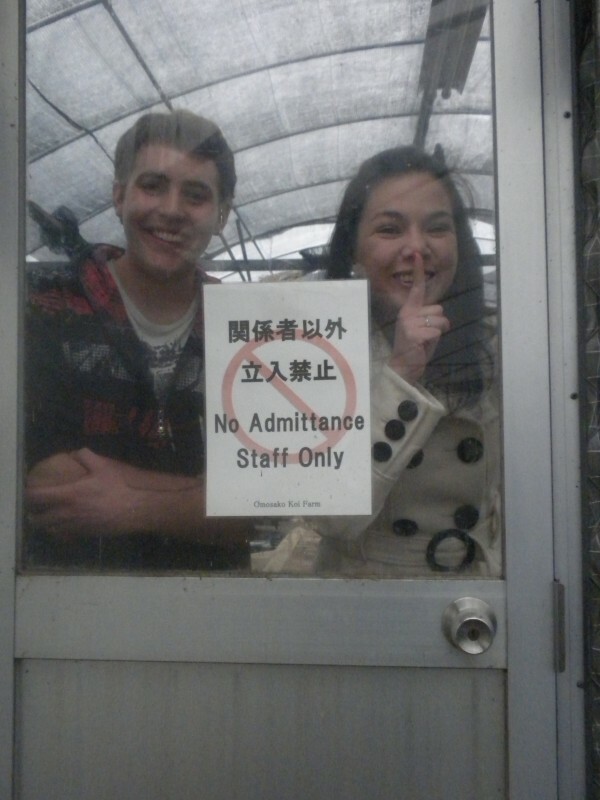 As punishment for sticking our noses where it shouldn’t be, Takahiro locked us in and threw away the key….We were trapped! Just kidding… 🙂 We decided to play around the farm a little bit after we finished photographing all the Koi we purchased. We also caught up a little bit with Mike Snaden who had arrived with a few customers with him. Since our business was completed, we headed into the greeting room to have some coffee and rest a little bit since our necks were rather stiff from peering down either into a pond or through a camera lens. Of course, we couldn’t leave the farm without first seeing all the Koi that Omosako currently had at his farm, so when the feeling returned to our necks, we began doing what we always do: poke around. Takahiro beat us to the punch and invited us to see the other Koi. At least this time it was under an invitation! hehehe…. Pretty cool, huh? 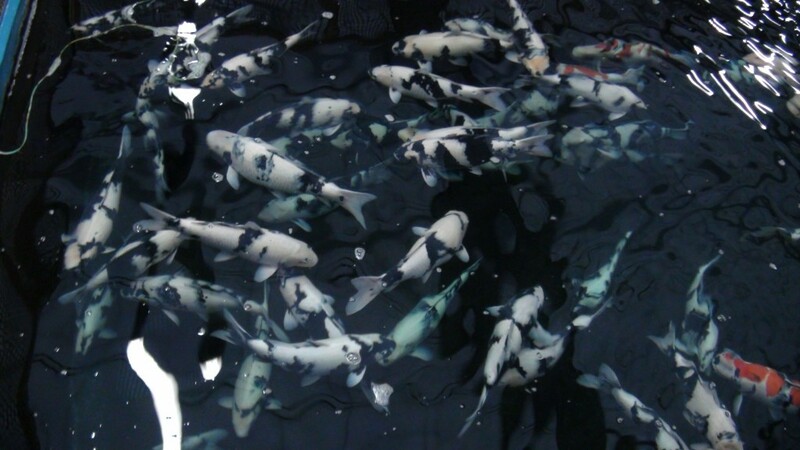 And look at the bodies on those Koi! After we had gone around, we decided it was getting late and the time came to return to our hotel to get a hot meal and a good night’s rest. Before we left, though, Takahiro approached us. f him in the Philippines that he wants to show you a good time too.” he said to us. “Your dad is famous in Japan!” Takayoshi added with a smile. I love being my father’s daughter. Despite having a mountain of work to do in preparation for the Wakagoi show that was setting up the next day, Sacho decided to take some time to spend with us. I was truly touched. Sacho took us to dinner at an Izakaya that he had been going to since he was 19. We exchanged many stories, both on Koi and otherwise, and the mountain of information we learned is one that I will treasure always. 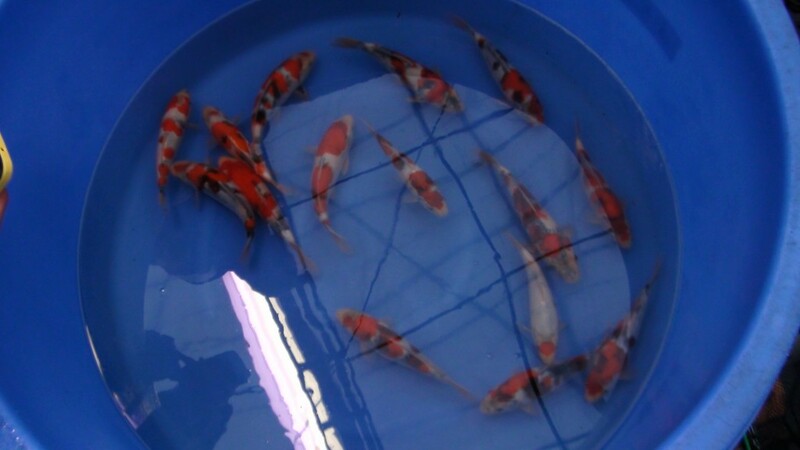 I asked him about how Omosako Koi Farm started and Sacho explained that his parents used to retail Koi rather than breed them. 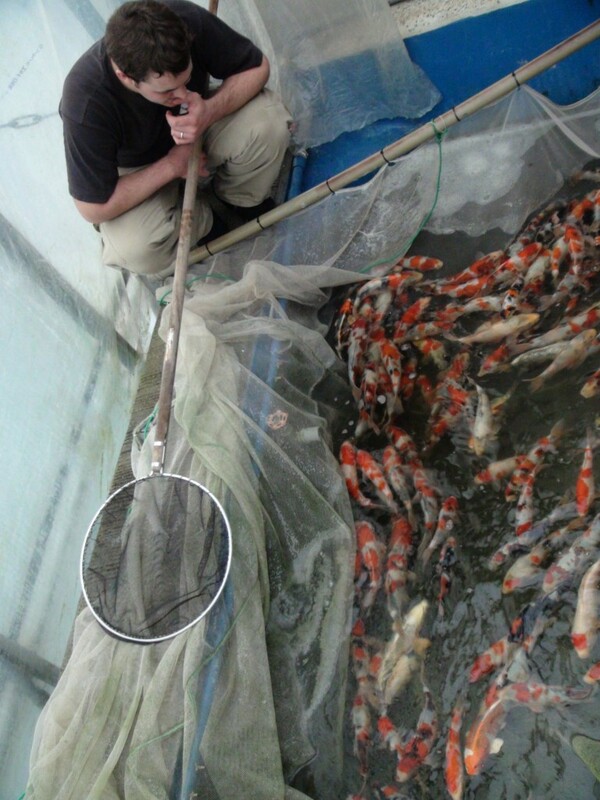 He continued on saying that he had very humble beginnings, but it was his passion for Koi and the determination to succeed that brought Omosako Koi Farm to the level that it is today. 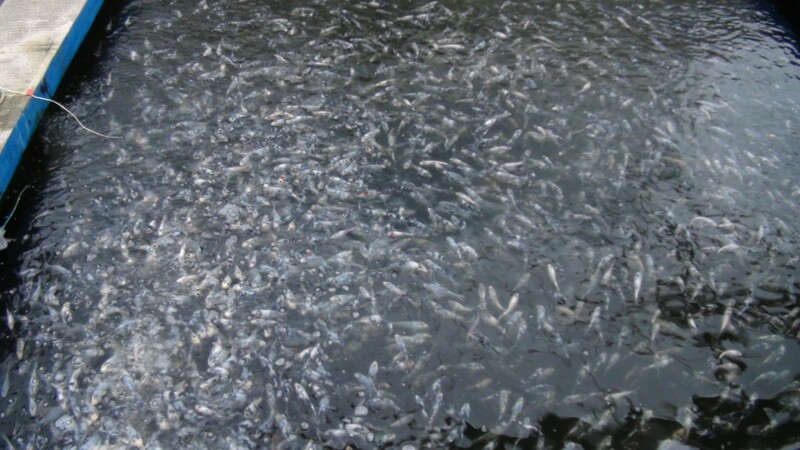 At one point, Sakai Fish Farm had decided to breed Shiro Utsuri, but for one reason or another decided they wanted to shift the focus away from that. Seeing an opportunity, Sacho spoke with the late, great Hiroji Sakai and worked with him to procure good parent stock in order to continue the Shiro Utsuri line. As we all know, he was very successful and today Omosako Koi Farm is renowned for producing some of the best Shiro Utsuri that the world has to offer. We parted ways a little before midnight and headed back to our hotel. Devin and I crashed into bed exhausted but extremely pleased with the amazing start we had to our trip. Tomorrow we would be travelling to Beppu Koi Farm in Matsuyama, which Devin describes as the “most romantic place ever in Japan”. I couldn’t wait to experience it for myself and tomorrow couldn’t come soon enough!